Milo De Angelis. Edited and translated by Susan Stewart & Patrizio Ceccagnoli. The University of Chicago Press. Chicago & London. 2013. These tight translations reveal Milo De Angelis, one of Italy's most important living poets, in splendid and somewhat sadly melancholy splendor. Susan Stewart and Patrizio Ceccagnoli, the translators, have found that elegant space between languages where syntax and sensibility are shared. There is nothing foreign about this voice. the nucleus, collapse into darkness. You go toward the shower. the skin's Spring, a perfect diagonal. stay there, stained with mascara. Dawn's angel looks at you, naked and taciturn. that the alliance has split apart. if they will come here, if we still will be able to save ourselves. at the hot pants' hem. These poems are sad business as De Angelis writes through the loss of his wife, writer Giovanna Sicari, with insight and tenderness. How does one fight an unvanquishable foe? How to face loss, live with it. Milo De Angelis takes us swimming in this deep, turbulent water. and the wheel of fortune. the blackberries' sweetness at the lips. this sheet of paper. The piazza shifts. turns into a lost line, sign of a time. of all the love that's been promised. in the secret clamor where they return. pricking into us more deeply. with one foot in the void. that no shade is protecting. carried one at a time. of big eyes without eyelashes. as it fades away. The moment chases us. where it smiles girlishly and has no limit. 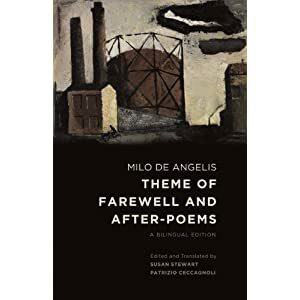 Milo De Angelis' Theme of Farewell and After - Poems is an elegy, an eulogy and an elegant love letter. Milan has never been so beautifully sad. Born in 1951, Milo De Angelis is the author of eight collections of poetry and two volumes of essays and is the translator of numerous works of European philosophy and criticism. Susan Stewart is a poet and the Avalon Foundation University Professor in the Humanities at Princeton University. Her most recent books are Red Rover and The Poet's Freedom, both published by the University of Chicago Press. Patrizio Ceccagnoli teaches Italian at the University of Massachusetts Amherst. "Milo De Angelis is surely among the most important Italian poets of our day, and this supple and subtle translation of his two most recent books is a gratifying event. These are poems of dense abstraction and rugged lyricism, and they come to life in grief, amid the asphalt of the poet's native city, Milan. Susan Stewart and Patrizio Ceccagnoli have done a terrific job of bringing them to America." "This careful work by Susan Stewart and Patrizio Ceccagnoli is the most capacious English rendering so far of this major contemporary Italian poet. One is able to follow the poetic and spiritual journey of Milo De Angelis as revealed in his passage from a gently eloquent tone to a more urgent language (perhaps precipitated by a lacerating personal loss). To be sure, the poet remains faithful to his distinguished elaboration of the post-symbolist heritage, such as the phrase repetitions with an emotional tinge, certain softly surreal images ('And you will fly across the courtyard / while someone you don't know leans / from the balcony with asphalt in his hands'), and well-rounded, quotable lines placed at strategic points ('in the secret clamor where they return'). But in the poetic development documented by this important volume, the Milanese poet—exploring his particular city-within-the-city-enters more and more deeply into a courageous exploration of self and past, resulting in a new opening to the world."